National studies show that better outcomes are achieved when people are treated in specialist centres, with senior specialist staff available on site. Healthcare services in Dorset face significant challenges arising from workforce and financial constraints, increasing quality standards, and the changing health needs of the local population. In response, Dorset Clinical Commissioning Group (CCG) – after carrying out a comprehensive, clinically-led Clinical Services Review (CSR) with extensive public consultation – is making significant changes to the way in which acute, GP and community-based healthcare services are provided. In particular, it was decided that the Royal Bournemouth Hospital will become a major emergency hospital and Poole Hospital will become a major planned care hospital. Dorset County Hospital will continue to provide emergency and planned services to meet the needs of people living in the west of the county. 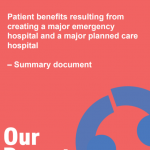 The decisions that were made in Sept 17 were made on proposals that were developed in conjunction with clinicians from all four NHS partners in Dorset, along with the local authorities, and having considered a huge amount of feedback from local organisations and members of the public. It is recognised that not everyone agrees with the decisions, however with the pressures the NHS is currently under and faces in the coming years, doing nothing is not an option, and changes need to be made. More information on the changes that were agreed in September 2017 can be found in our newspaper supplement. Our Dorset is a partnership of all NHS and local authority organisations in Dorset, working together to help local people have healthier, more fulfilling lives. For more information visit www.ourdorset.nhs.uk.